Be the envy of your neighbors with an expansive lawn of dark green grass. It's the perfect backdrop for your home or flower beds. Such lush, green growth is a sign of good lawn management and maximum turfgrass health. With the proper maintenance procedures, you can help your grass look its best. You can also take artificial measures to make your grass green during the times when even the best landscaper can't stop nature's normal cycles. Mow your lawn regularly, which encourages proper plant development and helps keep weeds at bay for a healthier, greener lawn. Mowing heights vary by grass type. The University of California publishes an online list of recommended mowing heights for both cool-season and warm-season turfgrass species (see Resources). Leave the grass clippings on your lawn after mowing it. The clippings will decompose over the next few days, returning valuable nitrogen to the soil for greener, lusher grass growth. Irrigate your lawn. Apply water according to the needs of your specific grass, since some are more drought-tolerant (e.g. zoysiagrass) than others (e.g. annual ryegrass). When you water, add enough water so that the soil is moist to a depth of 6 to 8 inches. This encourages deep root growth for overall turf health and increased drought resistance, keeping the grass greener even in periods of low water. 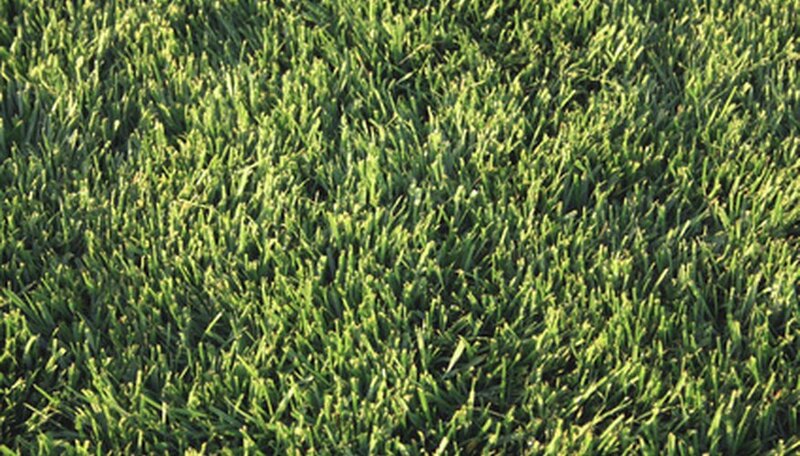 Fertilize the turfgrass every eight to 10 weeks with a standard lawn fertilizer. Apply the fertilize according to its labeled instructions, since potency varies by product. Follow the fertilization with a shallow watering to help carry the fertilizer's nutrients to the turf's root level. Dye the grass. Most grass species enter a period of dormancy during the fall and, no matter what you do, will fade in color or turn brown. Nurseries and garden stores sell lawn pigment that artificially restores a deep green color to the turf. Apply the dye according to its labeled guidelines. Typically, the dye will last three to four months and will fade as the grass begins growing again.